Is Blogging Dead? I say NO! (guest post). Please welcome Kristine (whose hair I covet but that’s a different post). I’ve invited her here to share her response to my musings on the State of the Blogging. I have a lot of thoughts on the topic of blogging. Even though I don’t write long “journalog”-type posts much, I still consider myself having been a blogger since April 2000. That’s forever in internet years, right?! I volunteered and then worked for a then-big blogging company in the 2000s, and so I know that shapes my perspective. I think blogging has shifted, not died. When I started, there was no commenting; to react to what a friend said, we wrote posts and linked to the friend. Comments let conversations happen on the original site, and so on my blog shifted to more personal content than reactions. When I didn’t know anybody else blogging, I started surfing “recently updated lists” and webrings, and followed new people. There weren’t as many blogs to go through! So now, there is a practically unlimited stream of new blogs and a wide variety of topics to read about. And as the number of social media sites swelled over the years, some friends shifted one direction like short tweets instead of blogs and others moved to private sites that made me have to sign in to see their content. And the number of people casually documenting their life on Facebook or Instagram, blogging shifted to suit those wide audiences. For me, blogging is another word for documenting my life. And as my life changes, I find new ways of documenting. It is easy some days to think that because I’m not writing those long journalog posts, i can’t consider myself a blogger. BUT NO! I am still documenting my life. Now, my Instagram posts are just as VALID as my original blog posts – describing what’s going on with pics and words. My Facebook blurbs and longer therapeutic posts may be to specific audiences, rather than public — still valid! And weekly video “blogs” about my knitting are in the form of a podcast, but it’s still documenting what lifestories come my way — it’s enough! and I am enough, no need for blogging guilt! And it’s what I can, when I can, in its own way, because those long hours I spent blogging aren’t as realistic for me as they were when I was less active from my fibromyalgia! capture the moments I CAN to document what I CAN! Oh, and in her post Carla lamented she didn’t like blogging on a mobile device? 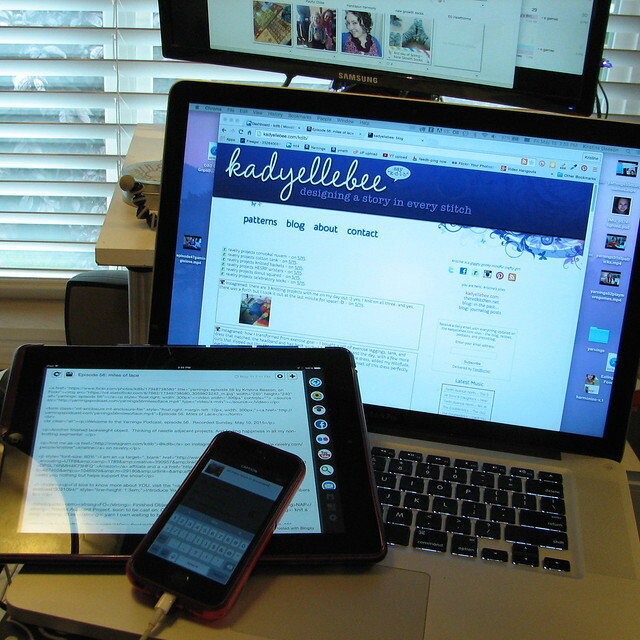 A couple of resources that work well for me: blogsy on iPad helps me write my posts on the go. Trello helps me take quick notes on all devices when I’m not quite ready to start a post. Do you love blogging as I do? Has your approach changed over the years? 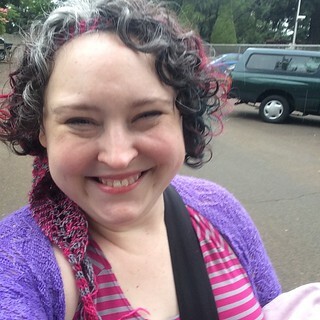 Kristine is a giggly geeky girl who loves to craft, growing in self-love every day. 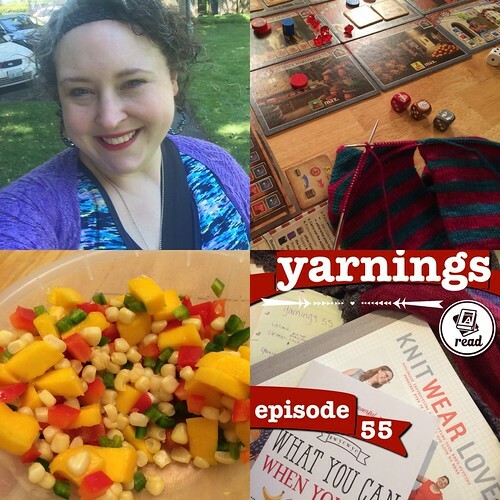 When I’m not being a “stay at home wife”, I am a knitwear designer and podcaster (psst, one of my most recent episodes reviews the wycwyc book – it resonates with people everywhere, including my knitting friends!) To follow me around on the Internet check out kdlb.com. I completely agree! Even though I’m still a newbie at just over 3 years of blogging, it definitely has shifted. There’s new mediums to fill in the gaps of just a blog, but it still tells a story in a way. IF that is what you want. And thanks for the mobile tips! I tweet more now but I miss the communication. People say how podcasting is the new blogging but that seems far more time consuming. I see some podcasts that are done with very little editing and I enjoy them. I see some podcasts that are pretty professional with text on the screen and I enjoy them. SOOOOoooo, I think podcasting can be as time consuming or time saving as you want it to be! try turning the camera on yourself and seeing if you enjoy it! I’m glad you say no because I’m just ready to start LOL! I invested blood, sweat and tears and would be so dissapointed if it was all for nothing. Although I must say I had fun creating it and I will go live soon, no matter what. I haven’t been blogging long enough to see the shift but it is interesting to hear how it has evolved over the years! When I’m tired I want to quit blogging but then when I’m sitting with my cup of coffee checking up on everyone, I love it! I love to knit. Can’t wait to check out your podcast! Back and forth…since 2000 also. I just still find it all kind of creepy that people put themselves “out there” to just anyone. I am a private person and like my privacy – even my close friends and hubby don’t have to know every little thing about me and what runs thru my head. I think it’s a personality thing. I’m more introverted offline, yet use online writings to process problems in my life. hello to a fellow long-time blogger 🙂 have you looked at blogging tools that would let you control who was reading? maybe that would make you feel like you could share more topics than you would in public. just an idea! I went into it with the mindset that if someone really wanted to know something about me, they could probably find it out. this alleviated some of the worries of creeps seeing what I was wearing or eating or thinking. YES. I have been going back and cleaning up some of my old blog posts and I see that I uses to get 45 comments on a post that sucked. Now I average about 12-15. Not that I’m counting.. just something I noticed because I am cleaning house. There are so many blogs out there, and new ones are being formed everyday. It’s like you said, things are shifting. Not good or bad… just shifting.. we need to roll with the times. I just started blogging this year, but have been following blogs since the early 2000s. I think it’s such a neat way to feel intimately connected with people who you may never meet in real life, but who share the same interests as you do. I get a lot of ideas about running (my main interest) simply from reading about what others are doing. You’re right, Facebook, Twitter, Instagram, etc are all different forums on which to do essentially the same thing — connect. As a new blogger (Jan 2015), I don’t think blogging is dead at all. I’ve gotten some great response in a short time. Yes, if I had started 10 years ago when not everyone was doing it I would have a much larger audience, but I’m happy having just a small number of people who are following my journey and getting inspired by it. Totally agree! With every day, blogging shifts and transforms, it’s inevitable! My blog is just me, meandering, and keeping up with holidays and happenings, because every day is something special to someone. The fact that you only got 15-16 responses in a week’s time says it all I think.. The fact that you received 15-16 comments over a week’s time pretty much says it all I believe!